Many people choose not to crate their dogs because they believe confining them in a small space is cruel. However, reputable training professionals and leading animal welfare groups including the HSUS, the ASPCA and Best Friends Animal Society believe that when done correctly crate training can be an effective training tool. According to behavior experts at Best Friends Animal Society, dogs are hardwired by their genetic history to be den animals. A den is a small, safe, well-defined space, a place where dogs instinctively feel safe. It is also a place where they naturally avoid soiling. The combination of these two native traits makes crate training, done in the right way, a kind and effective component in house-training a new puppy or dog. “When used properly crating is a very humane way to housebreak a puppy or to help a rescued dog feel safe while adjusting to a new environment,” said certified dog trainer Anna Cilento, who is the founder of Suruluna, a nonprofit that rescues and rehabilitates homeless dogs in the Hudson Valley. Cilento also works with local shelters and rescues helping them to train and socialize dogs. 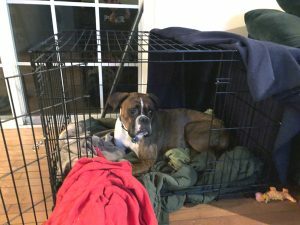 Stacy Miller, a client of The Traveling Leash and Playtime Doggy Daycare, crated the family’s boxer, Max, when they first brought him home as a puppy. An X-pen attached to the crate gave Max more space when home alone for longer periods of time. On weekdays a dog walker from The Traveling Leash took Max on fun adventures, which helped break up his day. Being confined to a crate kept puppy Max safe when home alone. Behavioral experts at the HSUS recommend crating dogs until they are housebroken and can be trusted not to destroy the house, and after that leaving the crates around as a place where dogs can go voluntarily. Now that Max is housebroken and has gotten past his puppyhood, he also has more freedom. His weekdays are divided between playing with friends at doggy daycare and mid-day walks around the neighborhood. When home alone doggy gates keep him from entering rooms where he might get into trouble. His crate is set up in the living room with the door open. Max often chooses the comfort of his “den” where he snuggles into soft blankets surrounded by favorite toys rather than laying on the couch. Max enjoys lounging out in his crate when he wants some down time. This positive association is key when it comes to successful crate training, Cilento said. “The biggest mistake people make when training their dogs is using the crate as punishment,” Cilento added. “When the dog does something wrong, they yell and put him straight into the crate. That’s the worst thing you can do because the dog will then have a negative association with the crate. Instead, Cilento said, every time you ask your dog to go in the crate give him or her a favorite toy or treat so the dog sees it as a happy place. Provides fearful dogs with the opportunity to retreat to a safe place when they need to be alone. Offers a space for exuberant dogs to calm down and relax. Gives dogs in families with young children a place to go for some peace and quiet when things get a little hectic. It’s a wonderful choice for dogs who are nervous or over-aroused during holiday parties or other family functions. 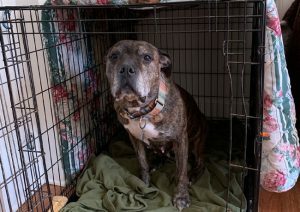 Brandy, who is available for adoption at Suruluna, loves to retreat to her crate when she wants to nap. Trainers caution that crating is not a good training tool for every dog. For example, dogs who suffer from separation anxiety don’t do well confined. Many will do almost anything to break out of the crate and can injure themselves. In these cases, owners may need to seek the help of a veterinarian or behavior specialist. What if You Really Don’t Want to Use a Crate? Dog owners who are frustrated with home destruction or house soiling, but are uncomfortable with crating can attach an X-pen to an open crate to give more space. Dogs could also be confined to a small safe space in the home with puppy pads used to protect the floors. 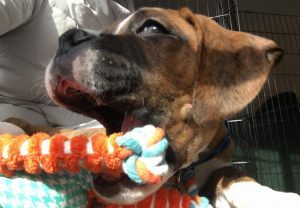 While providing more space for a puppy will prolong the housetraining process, Cilento said that almost all dogs eventually learn to do their business outside. “However, it is much easier to prevent accidents in the home by temporarily keeping a dog confined to a crate than having to correct the dog if he does have an accident in the house,” Cilento said. Don’t leave your dog in the crate too long. A dog that’s crated all day and night doesn’t get enough exercise or human interaction and can become depressed or anxious. When crating your dog you may have to change your schedule, hire a dog walker or take your dog to a daycare facility to reduce the amount of time they spend in their crate each day. Puppies under 6 months of age shouldn’t stay in a crate for more than three or four hours at a time. They can’t control their bladders and bowels for that long. The same goes for adult dogs being house trained. Physically, an older dog can hold it, but they don’t know they’re supposed to. The crate should be large enough for dogs to stand up and turn around. If your dog is still growing, choose a crate size that will accommodate their adult size. Block off the excess crate space so your dog can’t eliminate at one end and retreat to the other.